The Oklahoma State NSAC Team is back! National Student Advertising Competition (NSAC) is the most significant collegiate advertising competition in the nation. Each year, more than 2,000 college students gain the real-world experience of creating a strategic advertising campaign for a corporate client. This year’s client is Wienerschnitzel, and our team is already hard at work creating an amazing campaign! We will develop a marketing plan and pitch our campaign to advertising professionals at the district level. If we win our district, we will advance further to the regional and national level competitions. We had amazing successes in the last few years! Last year, our OSU team came in second in our district, losing by only 2 points on a 300 point scale. Two years ago, our OSU team won the second national place! We aim to raise $10,000 so our entire team can travel to Shreveport, Louisiana for the district round of completion. Your gift of any amount will bring us closer to the competition. Our team is counting on you to help us put our best foot forward at district competition! Our goal is to raise $10,000. Your support with one of the giving levels located to the right will help us make our way to district stress-free of financial worries. All gifts, no matter the size, will help us reach our goal of $10,000 and help us make our way to district competition. 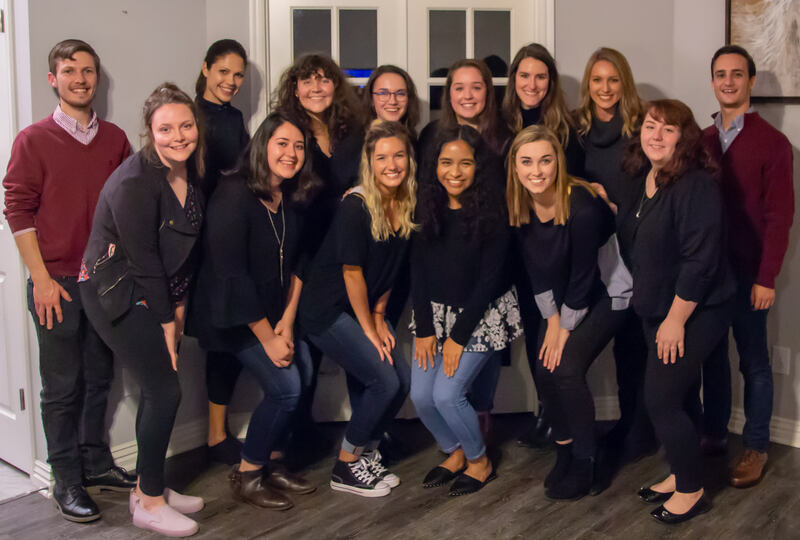 Meet our 2019 NSAC Team! Claire McKenzie: I have two roles on our NSAC team. I am on the secondary research team and I will be a writer on the production team in the spring. I am so excited to be a part of this team and create an amazing campaign! Ashley Brickman: I have two roles for the NSAC team this year. I am the research lead this fall and I will be on the promotions team in the spring. I am so excited to be on the team this year and I can't wait to show my creativity and skills into this campaign! Jenny Berry: I am currently serving as the focus group lead for the research portion of our campaign. In the spring, I will serve as the account executive. I cannot wait to work with such an incredible group of people and apply what I've learned in my classes to this exciting campaign! Kenzie Bush: As a member of OSU's NSAC team I serve on the survey committee to conduct research on our target audience and prospective customers. In the Spring, I will serve on the Promotions team. I can't wait to implement my ideas to make this campaign successful! Amy Woods: I have two roles on this years NSAC team. Currently, I am on the fundraising team and in charge of social media communication, and next semester, I will be working on the creative team. I am so excited to be a part of the NSAC team, and I can't wait to create an amazing campaign with this talented group of people! Halle Barham: I am currently serving on the fundraising team for NSAC in the fall semester. However, in the spring, my focus will shift toward video production on the production team. I'm so excited to see what this team is able to accomplish in the coming months! Katie Cohen: I am currently serving on the primary research team focusing on collecting survey data. In the Spring I will be on the promotions team. I am so excited to bring this campaign to life and work alongside other creative individuals. Alex Christy: I am a member of the secondary research team this semester. In the spring, I will be the writer for the media team. I am looking forward to applying and advancing my skills in this competition. Madison Bradford: For the 2019 NSAC team I have two roles. I am the fundraising chair this fall and for the spring I am on the creative team! I am so excited to be a part of this program and excited to have real world experience in the industry of advertisement! Toni Trainor: I am currently on the secondary research group. In the spring, I will be a part of the creative team. I am so excited to represent OSU by contributing to a hardworking team. Addison Skaggs: I am serving as the survey research lead and creative lead for OSU NSAC this year. I am excited to work with this incredibly talented group on a real campaign. Stephanie Rojo: I serve in two capacities on the NSAC teams. This semester I am a part of the focus group team and will work on the media team in the Spring. The opportunity to work on this campaign is one that I am very much looking forward to. Bailey Gilbert: This fall, I'm the Team Lead for Secondary Research, and I'll lead the Media team in the spring. I'm excited to help our NSAC team earn another victory! Caleb Jones: I will be producing creative content for our campaign this year. My main focus is video production so be on the lookout for awesome videos! Rachel Moretti: I am currently serving as a focus group researcher and next semester, will be part of the promotions team. I am eager to collaborate with this outstanding group and build a winning campaign for our 2019 client! Lauren Mitchell: I'm the lead graphic designer for our 2019 NSAC team. I will be working closely with the creative team to create and carry out our design vision. Zachary Johnston: I am the graduate assistant for this year’s team. I plan to help them in any way to make sure this campaign is the best it can be! You will get a heartfelt thank you from us! Your gift of $20.19 represents the year 2019, when we will be making our way to the District 10 competition! Thank you! Your gift of $20.17 will represent the NSAC 2017 Team when we got 2nd national title! Thank you! Your gift of $20.18 will represent the 2018 Ocean Spray Team! Thank you! Your gift of $20.16 will represent the 2016 Snapple Team! Thank you! Your gift of $20.15 will represent the 2015 Pizza Hut Team! Thank you! Your gift of $20.14 will represent the 2014 MaryKayTeam! Thank you! Your gift of $21 represents each member of the 2019 OSU NSAC Team! Thank you! Your gift of $50 will pay for a member's meals during a three day trip to the District 10 competition! Than you! Your gift of $76 will represent the year when the OSU sent the first NSAC team to compete. Thank you! Your gift of $135 will pay for a one-night hotel stay, accommodating four NSAC members! Thank you! Your gift of $398.50 will represent each mile we will travel to Shreveport, LA, where the District 10 competition will take place! Thank you! Your gift of $500 will cover all supporting materials we will need throughout the competition! Thank you! Your gift of $796 will cover all gas expenses, bringing the whole NSAC team to the district competition. Thank you! Your gift of $1350 will pay to accommodate all of us in a conference hotel for two nights! Thank you!